There are a few ways to give yourself a great zombie appearance. One way is to let a zombie bite you and become one. 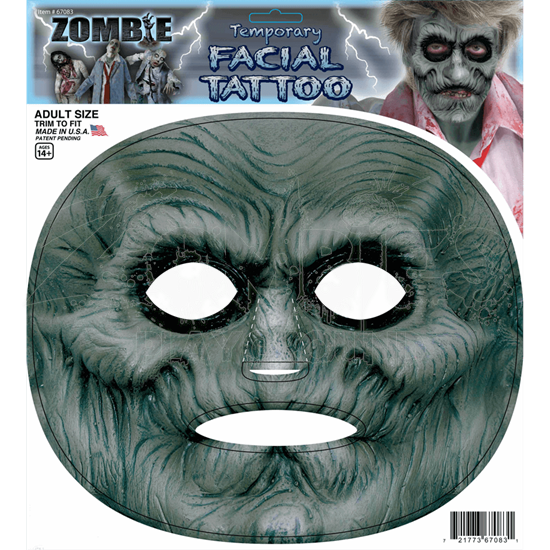 Another less dangerous way comes from the application of this incredible looking Zombie Facial Tattoo. This temporary tattoo is easy to apply and goes on with ease. It can be trimmed to fit various sizes of faces. Once applied, it gives the face a ridged, emaciated look that is typical of all zombies, as well as an unhealthy green pallor that signifies not only death, but un-death, having arisen from the grave to seek the flesh, blood, and brains of the living. The tattoo features cut-outs for the eyes, nose, and mouth, so that the tattoo is not applied over these sensitive areas. Do not put yourself in personal harm by approaching a zombie. Instead, apply this Zombie Facial Tattoo and you will suddenly look just like a real zombie, ready to shamble down the street in search of your next meal!